There are three things I look for in a cattle auction. 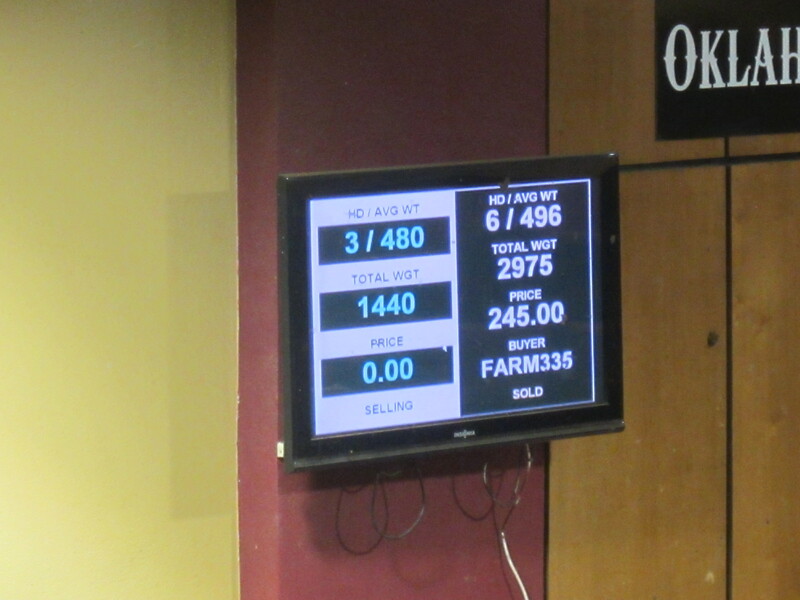 OK, that’s a lie–I have no idea what to look for in a cattle auction. 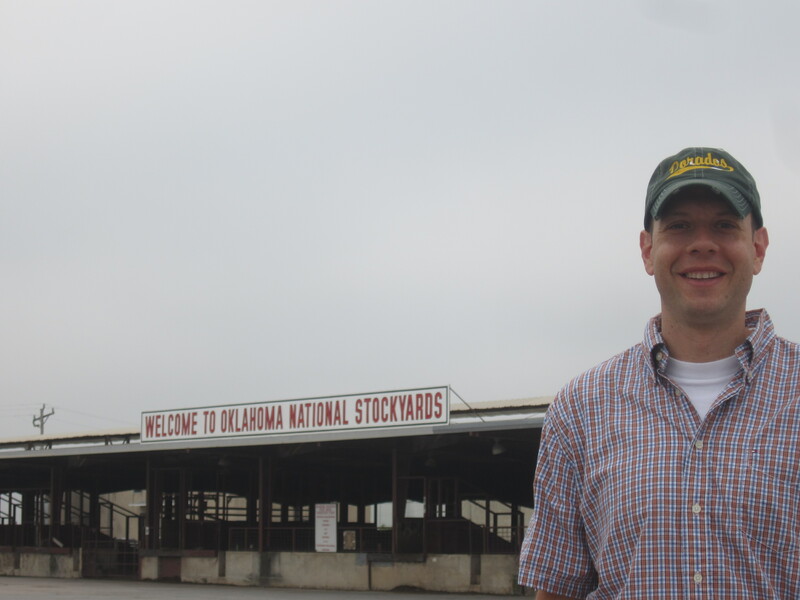 All I knew was that there is such a thing, and it’s held in the Stockyards City section of Oklahoma City every Monday and Tuesday morning, and we could go watch it happen. When planning the itinerary we always look for activities or sights that are unique to the area and that we can’t do or see at home. 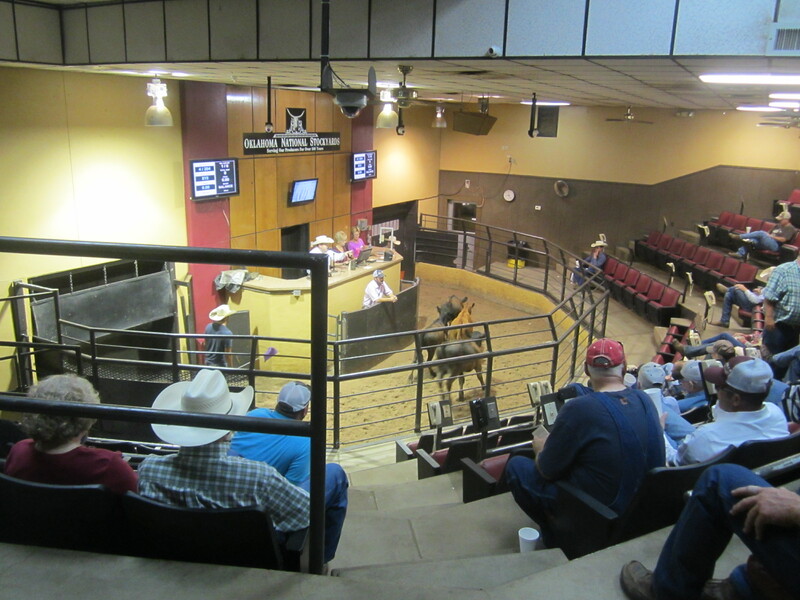 A live cattle auction qualifies in spades. It required a late night of driving Sunday and a very early wake-up call Monday morning. But there will be other opportunities to sleep; there will not be other opportunities to bid on a cow (or to watch other people bid on cows, anyway). 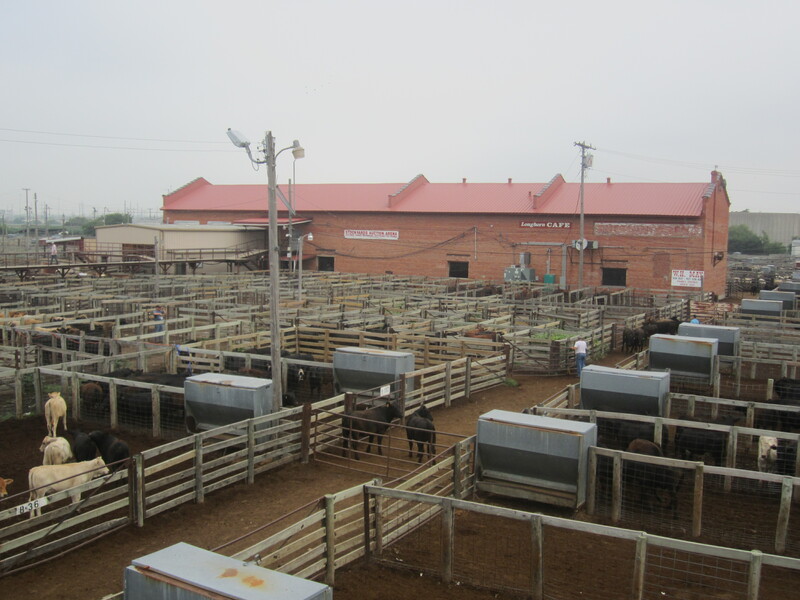 Once we got to Stockyards City it took us a little while to find the auction, because we were foolishly looking for a storefront or an auction building. 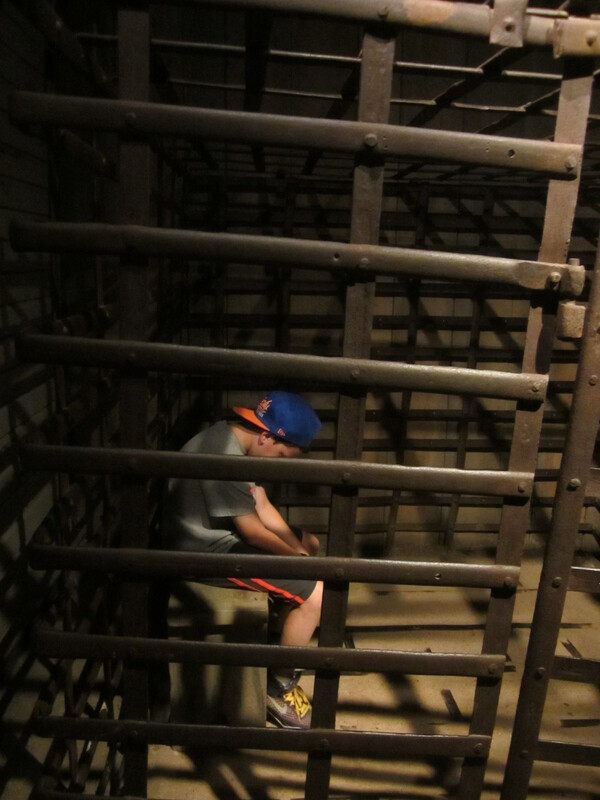 Instead, we had to cross a long catwalk that wound its way over the many dozens of holding pens where the batches of cattle up for sale were being held as they waited their turns. It actually is set up like an arena of sorts: cushioned stadium seating around the perimeter of a semicircular room, all looking down onto the auctioneer, his helper ladies, and a smaller semicircle where the cows would be brought in from the left side for a minute or two and then ushered out the right side as soon as they were sold. The first thing we noticed was how inappropriately we were dressed. There were lots of cowboy hats but an equal number of baseball caps. We were wearing baseball caps, so we were OK there. But that’s where it ended. Every single person there was wearing jeans, and every single person there was wearing boots of some kind–mostly cowboy boots and a handful of Timberlands. We were in shorts and sneakers. As you can see from the above photo, we took seats in the back and tried to remain as inconspicuous as possible. Watching the auction was my secondary goal, as my main goal was to avoid ruining the auction in some ridiculous way that would happen only to the stars of a bad sitcom. The dude in the cowboy hat at the tall desk is the auctioneer. Next to him are administrative assistants to enter info about the cows into the computer and display the info on the video boards that are on the wall behind them (more on that in a minute). The guy in the baseball cap who’s standing right in front of the tall desk and looks like he’s been put in a timeout is the seller, or at least a representative of the seller. 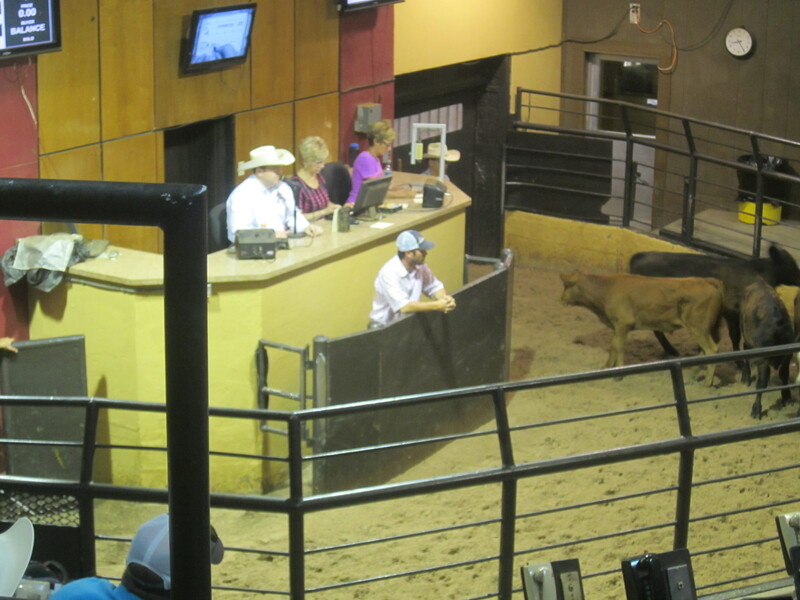 He gives the auctioneer any pertinent info about each lot (antibiotics, diet, etc. ), and when his lots are all sold he leaves and a new owner stands in that spot. The cows there are of course the ones for sale at the moment. Notice there are a few of them. In the hour that we watched, we saw lots of no less than three and no more than 18. It gets a little hairy when 15-18 cows are running back and forth in that little area. Meanwhile the cows are so confused about where to go that there’s a guy on each end of the (stage? pit?) whose entire job is to shoo the cows in the opposite direction when the need arises. Meanwhile, the only real details about the cows that the audience gets besides looking at them is whatever they can decipher from the auctioneer’s lightning-speed announcements, and the TV monitors on the wall, which simply display the number of cows in the lot, their average weight and total weight, their price, and their buyer. The info on the right is the just-sold lot; the info on the left is for the current lot. These are not costumes. These are our new hats. Oklahoma City is a modern city with skyscrapers and cars and an NBA team and everything, but we decided to keep the cowboy theme going for just a little while longer by visiting what used to be the Cowboy Hall of Fame and is now the Cowboy Hall of Fame and Museum of Western Heritage, or some such impossibly long name that means cowboy museum. We’ve been to several halls of fame on our road trips: baseball, football, rock and roll, tennis, basketball, and even St. Louis Cardinals. On our way to Chicago last week we drove past the RV Hall of Fame in Elkhart, Indiana. I say “drove past” because we had absolutely no desire to go inside. I mean, why would there even be an RV Hall of Fame, and what would be in it? RV models that were especially popular? RV designers and manufacturers? People who drove their RVs to a whole lot of places? We will never know, or care. But Oklahoma City boasts two HOFs: cowboys and softball. I’m sure the softball HOF is lovely, but we decided to pass on it because, as much as we like playing softball, we don’t really know anything about the people who have excelled at it, once you get past Jennie Finch. And I’m saying this as someone who literally wrote the book on softball. 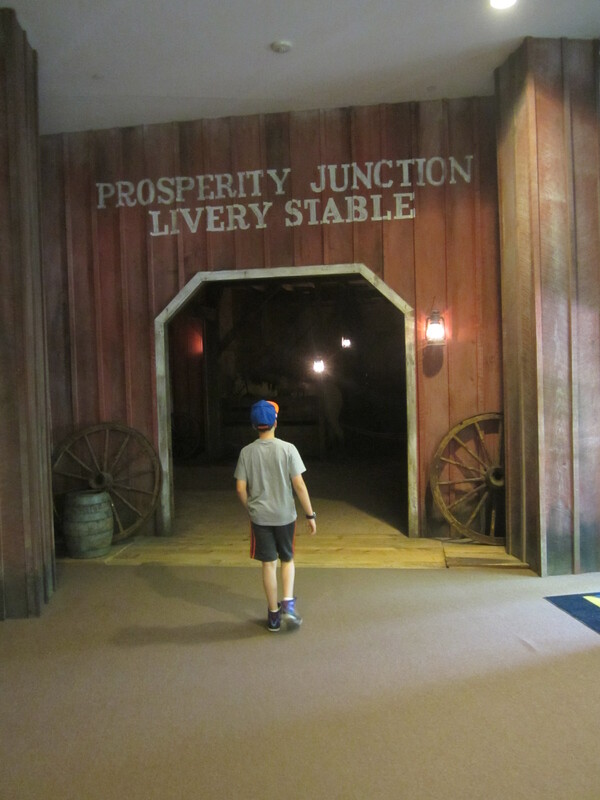 Our pop culture knowledge has a gaping hole when it comes to Western culture and rodeo as well, so we sped through the hall of fame part of the cowboy museum. 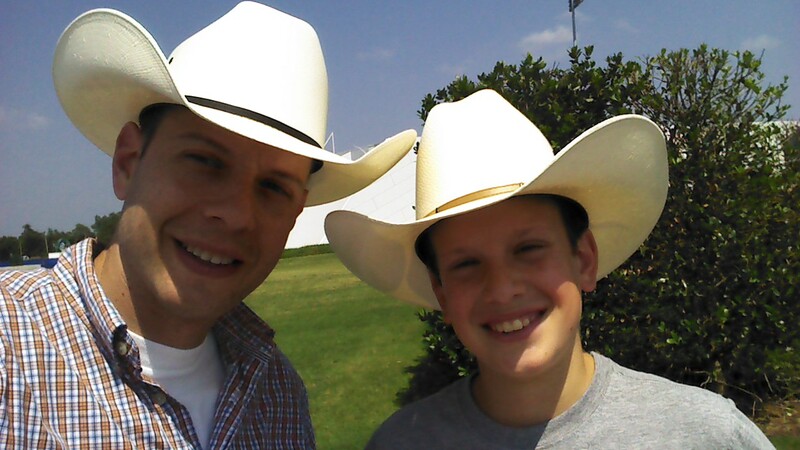 We also sped through the cowboy art part, and the cowboy history part, and the cowboy clothing part, etc. Where we lingered was the interactive (and very convincing) Old West town, where we got to walk into a schoolhouse, a saddle shop, a local jail, a saloon, etc. as they might have looked and sounded in 1905. Eventually we left the Old West behind for some more modern digs. 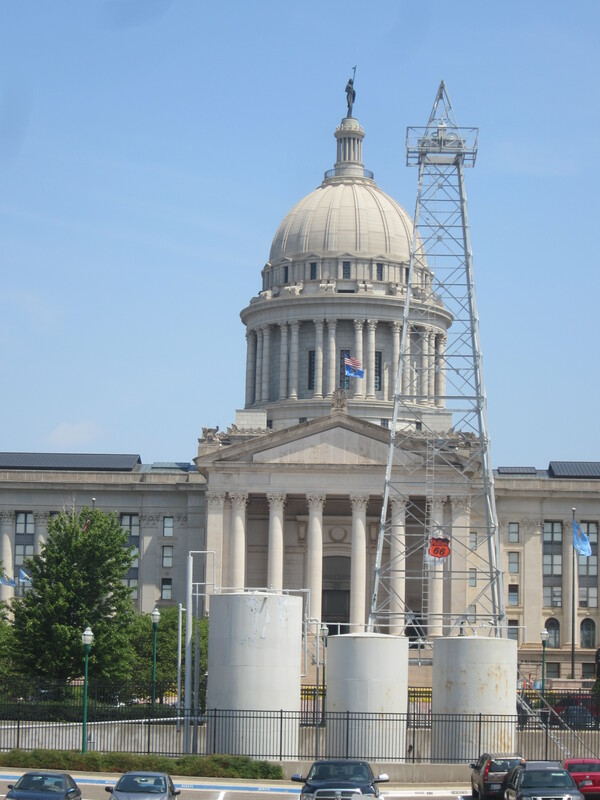 We paid a quick visit to the state capitol, which looks pretty much like a lot of other state capitols with one major exception: it’s the only one with a working oil well on the grounds. Then it was time for a little modern history: the memorial for the 1995 Oklahoma City bombing. When planning this trip I went back and forth about whether to visit such a somber and upsetting site on a happy vacation, especially with a child who gets very sensitive about discussing death. Ultimately I decided to go, partly because as New Yorkers I think we have an odd kinship with OKC when it comes to terror attacks, and partly because I just felt like the victims and the survivors deserve our attention, even if we’re on vacation. 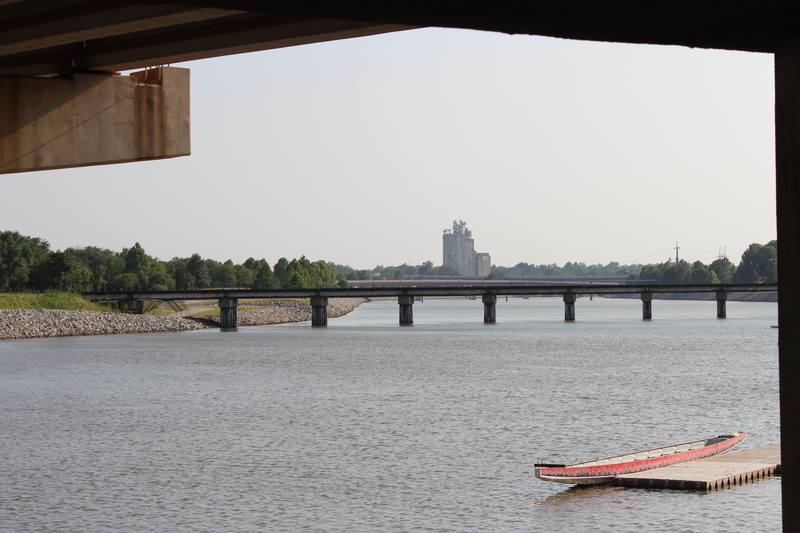 If you want to have fun in Oklahoma City, do not visit the Oklahoma City National Memorial and Museum. If, however, you are looking to be moved to tears (literally, tears) by hearing the grief of parents who lost their children to terrorists, by the sound of the bomb going off, by interviews with survivors, by several seemingly random objects found in the rubble–a set of keys, a coffee mug, a stuffed dog–that convey so much more meaning than you ever thought they could, by reliving the horror of April 19, 1995 … well then you should most definitely go there. Sam and I went to the museum before the memorial, reasoning that the memorial would be more meaningful after going through the museum. All I can say is that I can’t think of a single way that this museum could have been done any better. It starts with a brief exhibit on terrorism in general and then focuses on what was happening throughout the city on that morning in the hours and then minutes before the bomb went off. Then you experience the blast itself by sitting in a conference room and listening to a brief audio recording of a meeting of the state water board, which was going on a block away from the Murrah Federal Building. The meeting starts at 9 a.m. and goes on for two minutes until it’s interrupted by the blast and then immediate chaos. (The building where the meeting was held was damaged so badly that it ultimately had to be demolished. A moving tribute to the rescue workers who helped out at the scene now resides in its place.) From there there are many exhibits about the immediate aftermath of the bombing–news coverage, the search for survivors, the long and painful recovery of some of the injured survivors, etc. Sam was overcome with emotion when we heard stories of the search for surviving children from the daycare center that was in the building, and asked to leave. I was on the verge of falling apart myself, so I immediately obliged. Seconds later we were walking out of the building, both shaken, and it’s the only time he’s ever asked not to go to the gift shop. The museum is in the Journal Record building, which was across the street from the Murrah building and sustained heavy damage but has since been repaired and (obviously) repurposed. What used to be the street that ran between the two buildings is now a block-long reflecting pool. The footprint of the Murrah building is now a lawn populated by 168 chairs, each engraved with the name of a victim, and arranged in an order too complicated for me to properly explain. I took many pictures of all of this but I’m not going to share them with you here. If you want to see what this all looks like, please go visit. You will not enjoy the experience but you will not regret it, either. 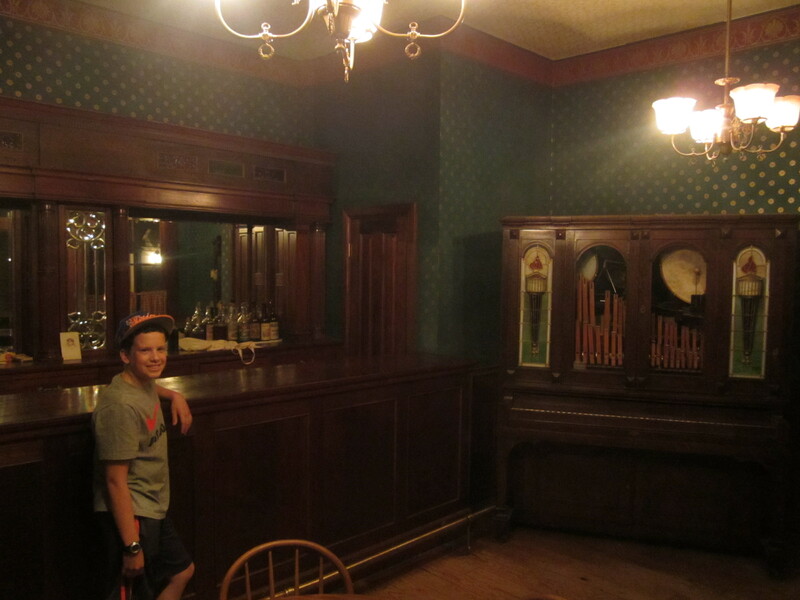 At this point in our day we were originally planning to take a tour of a historic old mansion in the center of town, but Sam decided it would be too boring and insisted that we skip it. I agreed, and I was briefly at a loss for what to do next. We had seen a great may things already but none of it took very long so we still had a few hours of day left before dinner. At some point during our travels trough the city we noticed an add for zip lining across the Oklahoma River, though, so I did some quick research and discovered that it was reasonably priced, not very far away, and open until 10 p.m. Oddly, when we arrived at the zip lining place we were the only ones there. It turns out that my quick research was a little too quick, and I missed the part about it being closed on Mondays. 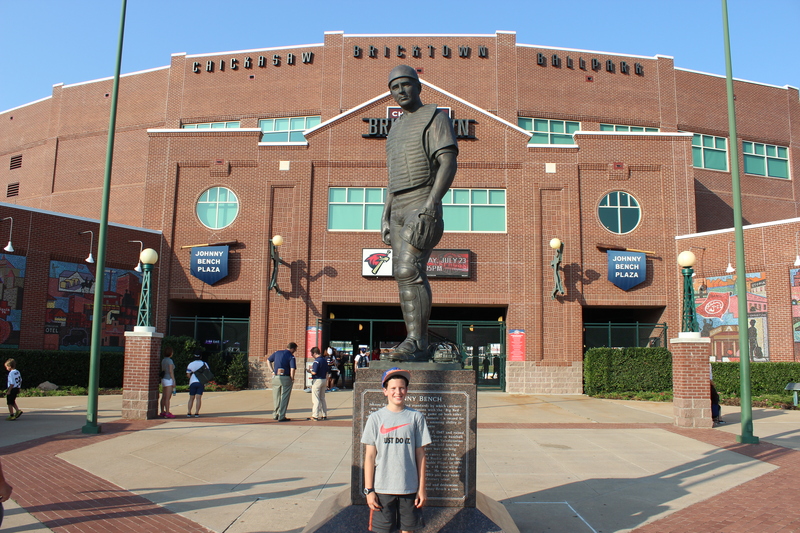 Then we headed to Chickasaw Bricktown Ballpark, home of the Triple-A OKC Redhawks, for our first actual baseball game of the trip. The weather was disgustingly sticky but the ballpark, which is built entirely of red brick, was wonderful. Inside and out, it has to be the nicest minor league park I’ve ever been to. On the outside, bronze statues of Oklahoma’s most accomplished major leaguers (Mickey Mantle, Johnny Bench, and Warren Spahn complement the brick facade and welcome fans into each gate. 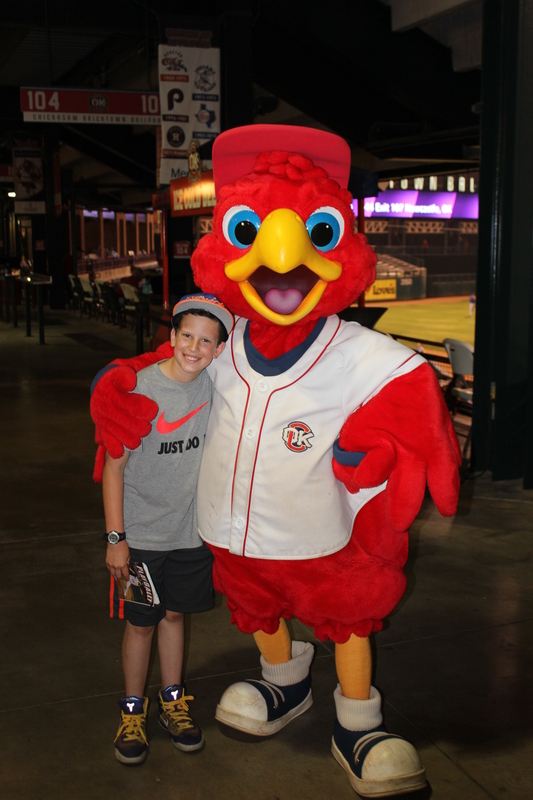 Inside, the stadium is roomy and beautiful and about as close to feeling like a Major League park as a Minor League park possibly can, and the mascot, Cooper, is easy to find. The only downside is that the Redhawks are the minor league affiliate of the Houston Astros, who are absolutely terrible. In fact, the Redhawks were losing 4-0 before even coming to bat. But they battled back repeatedly, and in the bottom on the eighth inning they tied the score at 9. Unfortunately lousy defense in the top of the ninth doomed them to an 11-9 loss. 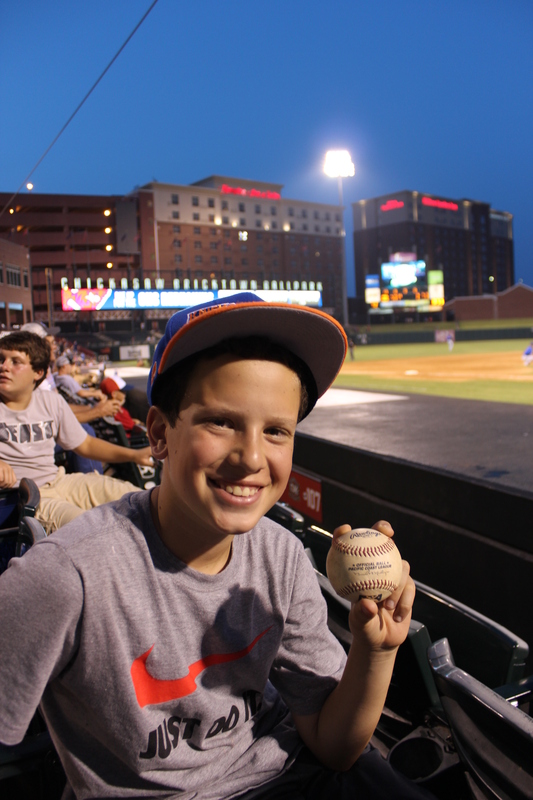 But the temperature eventually cooled off (even if the humidity never broke) and Sam continued his streak of getting tossed a ball in every minor league game I’ve ever taken him to (outside of Brooklyn). So we’re calling it a win. Our time in OKC was exhausting in every way, but it turned out to be far more than just OK, as the state motto would have you believe. We’re going to miss this town.